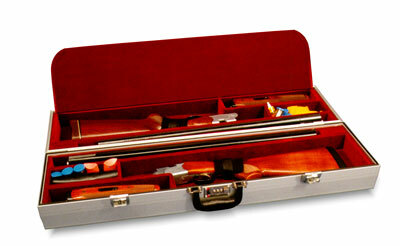 This Americase Premium Series case is designed for the two classics, fore-end off gun. The 3001 holds two complete shotguns, side by side or over-and-under. There are compartments for two stocks, two fore ends, two barrels up to 31 3/8” and two storage/tool areas. This case is equipped with a grip strap for your stocks, and a protective flap with Velcro closures that ensures guns are protected at all times. The interior is lined with velvet. This case comes with 2 high quality key lockable latches, a combination lock and meets airport security guidelines. Ext Dim: 32 1/2 x 9" x 6 1/2"
BBL Slot: 31 3/8" x 2 3/4"
LH Storage: 7 1/8" x 2 3/4" x 2 5/8"
Fore-End: 12" x 2 1/2" X 2 1/4"
Stock Size: 23 3/8" x 6 1/4" x 2 1/4"